← Slim Away…Just in Time for Summer! 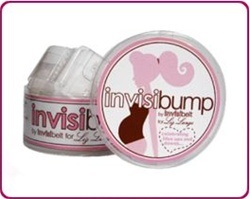 InvisiBelt Bump…for the Growing Belly! Congratulations, you’re expecting! What an exciting time in a women’s life. But with the excitement of expecting a little baby come lots of changes…the beginnings of them happen to your body! The first few weeks, your clothes fit just fine but then there comes that in between stage where your pre-pregnancy clothes don’t quite fit but you’re not ready for maternity clothes. Welcome InvisiBump. Invisibelt teamed up with Liz Lange to create InvisiBump, an extendable belt to keep your pants on and give your growing belly support while your weight fluctuates. The nice thing about InvisiBump is that it lies completely flat so it won’t create the dreaded “bulge” under your shirts that traditional belts cause. InvisiBump extends to 54″ so you’ll be able to stay in your pre-pregnancy clothes for quite a while! InvisiBump is also great for post-pregnancy while your belly transitions back to it’s pre-pregnant size.